Intended for use as a training aid, this is a factory cutaway showing the inner components and workings of the Netherlands' version of a typical shrapnel round used by most of the world's artillery circa 1900 to 1940. This is an exceptionally complete and detailed sectioned artillery shell. It has everything- including the fuze cover, powder ties, powder cover, all internal and external parts. This was a deaqusition from the Dutch war museum when they were changing their holding about 20 years ago, and is now in a private collection in the U.S. Invented by Lieutenant Henry Shrapnel, Royal Artillery, and adopted in 1803, "spherical case" consisted of a hollow shell filled with musket balls and an explosive charge to burst the projectile and scatter the contents when the charge was ignited by a poweder train fuze. These were anti-personnel weapons which could be effective at much greater ranges than the shotgun-like charges of grapeshot or canister fired at close range. For use with cylindrical shells, the design was slightly modified; the new hollow cylindrical shells had a nose mounted time fuze, a central flash channel around which the resin-encased shrapnel balls were placed, and a hollow containing black powder at the base, above which was a plate that was joined in the centre to the flash tube. At a preselected time during flight, the fuze functioned — the flash was directed down the central tube and ignited the rear powder charge. The powder charge was just enough to shear the fuze threads or pins, and force the shrapnel balls out. The vast majority of the balls' velocity came from the terminal velocity of the shell. Once loosed, the shrapnel balls became a hail of spherical bullets following the line of fire, creating an oval pattern upon striking the ground. Though highly effective against unprotected troops, they were useless when the troops are protected by cover, such as in trenches. Except for the use of a mechanical (clockwork) time fuze instead of a powder train fuze, the projectile is very similar to those used in rifled artillery since the 1860s. The shell illustrated below represents the ultimate in shrapnel design. It functioned in the same manner as earlier types, and construction differed only in detail. About 300 lead balls approximately 13mm in diameter were used in the 18-pounder (3.3 inch) gun, slightly larger than the 75mm (3 inch) example above. To prevent movement of the balls, which would have made the shell ballistically unstable, they were set in rosin. The balls had to reach the target with a velocity not less than 450fs (137m/s) to kill or inflict serious wounds. Thus the shell had to burst at just the right point on the trajectory; too far back, and they lost velocity and became ineffective, too far forward and the beaten zone on the ground was reduced in area. Amounting to only 1¾oz (50g) the powder charge in the tin box was sufficient only to eject the balls etc from the body of the shell which dropped to the ground intact. The balls carried on at the velocity of the shell at the point of burst, ie scattering its 'remaining velocity'. 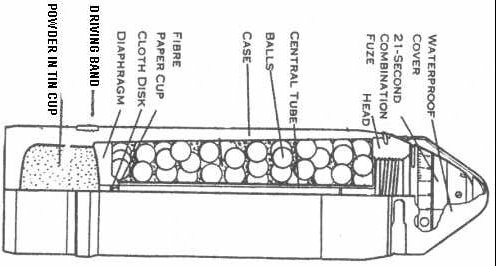 With the advent of relatively insensitive high explosives which could be used as the filling for shells, it was found that the casing of a properly designed HE shell fragmented so effectively that additional shot was not required. For example, the detonation of an average 105 mm shell produces several thousand high velocity (1,000 to 1,500 m/s) fragments, a lethal (at close range) blast overpressure and, if a surface or sub-surface burst, a useful cratering and anti-material effect — all in a munition much less complex to make than the later versions of the Shrapnel shell.